Durban, 16 January 2018: Drivers and commuters in the Mt Edgecombe area will have noticed a significant improvement in traffic flow since the upgraded 4-lane Flanders Drive M41 Bridge has been opened. Linking Mount Edgecombe to the Cornubia Business Hub and other Cornubia businesses, the new interchange also provides direct access to Cornubia for commuters travelling along the M41. The new bridge and interchange has effectively doubled the number of lanes crossing the M41 as well as enhancing access and egress to and from it. It has been designed to handle the increased traffic that will be attracted to the greater Cornubia Development and specifically the Cornubia Business Hub. This is the third bridge giving easy access into Cornubia, the others being the bridge over the N2 motorway which connects Cornubia with the uMhlanga Ridge Town Centre and the bridge over the railway line and MR79 giving access from the R102. Travellers using Flanders Drive should now find improved travel times where the new ramps and traffic signals should improve the traffic flow through the interchange. Where M41 travellers are used to the significant back up of traffic from the N2 Mount Edgecombe interchange around peak traffic times, once the adjacent upgrade of the N2/Mount Edgecombe Interchange is completed, the traffic congestion on the M41 will be eliminated with the free flow of traffic through it. This R280 million project which began in 2015, was co-funded by the eThekwini Municipality and Tongaat Hulett and is a testament to the benefits of public and private sector collaboration. In addition, the project created 303 local jobs while also benefiting local business. Four local contracting companies – Fakujitha construction, Mthamara construction, Sizanakho Civils and Acol Landscaping – were involved in the project, spreading the economic benefit and enhancing skills acquisition. Significantly, two contractors improved their cidb* grading as a result of this contract: Qwadile Construction went from 2CE to 5CE and Sizanakho Civils from 2CE to 4CE. With civils designed by SMEC, the architectural aspects designed by Nathan Iyer and Associates and built by Fountain Civil Engineering, the new bridge follows the style of development on La Lucia Ridge and uMhlanga Ridge. Bosch Projects designed the lighting which has been supplied by Tongaat Hulett Developments. 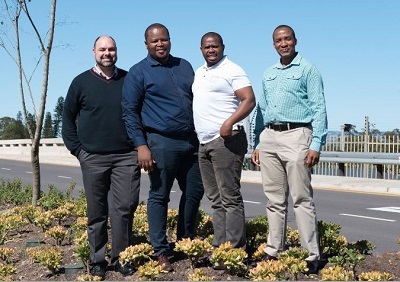 All roads are pedestrian friendly with wide pavements and a R15 million landscaping project that was designed by Uys & White Landscape Architects. Idube Landscapers won the landscaping contract and were required to employ four SMME companies to work on the project. These SMMEs were mentored by Idube. Several trees growing alongside the existing (small) road were felled, while alongside the Mount Edgecombe Country Club new trees are being planted. Interchanges and on and off ramps to the M41 had to be cut and built for easy access to the retail centre from Phoenix and from the M4. A contract such as this often experiences setbacks and this one was no different, albeit with a modern twist. “We incurred some delays resulting from having to relocate additional fibre optic electronic communication cable network that had been installed between the time of tender and construction commencing,” adds Sefehle. The benefits of this development are already being felt, but as the Cornubia precinct continues to grow and develop, the advantages will be experienced for many years to come. * Construction Industry Development Board – a Schedule 3a public entity established to lead construction industry stakeholders in construction development.